The following is a brief guide to supplementing with the ergogenic aid creatine. Creatine is a natural substance made by the body, found mostly in muscle tissue. Because of its role in energy generation and exercise recovery, it has become popular as a sports supplement - or ergogenic aid - particularly among those who wish to increase strength, endurance, and lean body mass. Energy: Creatine is a "back-up" source of energy production in the muscles, supporting quick bursts (about 10 seconds' worth) of high-intensity activity, as in power-lifting, sprinting, and volleys. 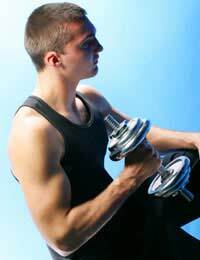 Volumising: Creatine pulls water into muscle tissues, increasing their size, and enhancing a "pumped up" look. Lactic Acid Buffer: High-intensity exercise often causes a burning sensation in muscles, a sign of lactic acid build-up. Creatine has been shown to delay this process. Protein Synthesis: Creatine may promote building of muscle mass by driving the use of dietary protein by muscle tissues during resistance training. Antioxidant: Creatine has been suggested in laboratory research to possess antioxidant capabilities, acting against free radicals naturally generated during exercise. Several studies have been conducted based on the above properties to see if supplements could improve the performance of various sports activities. While these were not considered of adequate power or quality to draw firm conclusions, most yielded at least mild benefits. Purity: Many creatine products use the 'Creapure' brand, made according to specific standards that limit the degree of contamination. Whether or not this source is used, product labels should list purity assay results, and/or provide contact information for requesting them. Additives: In addition to fillers and binders, some creatine products contain sweeteners and dyes. Note that the more additives there are, the less actual creatine will be available per dose. Carriers: Carriers are chemical compounds that enable creatine to more effectively be absorbed or utilised by the body. Unfortunately, not all forms are created equal or even supported in the research. The most widely available - creatine monohydrate - is comprised of 88% creatine and 12% water, meaning that for every 5 grams of powder, 4.4 grams is pure creatine. While the loading phase is not essential, it has been observed to shorten the time to results by 50%. Because excess creatine is converted to creatinine - a natural but toxic byproduct - and released through the kidneys, some experts are concerned that high doses could cause kidney damage. Primary side effects associated with creatine supplementation have been reported to be gastrointestinal distress - including gas, bloating, and diarrhea - and muscle cramping, possibly due to increased water retention (see Volumizing above). No long-term studies on creatine supplementation in humans have been conducted, and risks associated with extended use in laboratory animals have thus far been observed only at a very basic level.